Ahhh…Summertime! Warm weather, gardening, swimming in the local pond, and, best of all, County Fair Time! Here in the Midwest, we take our County Fairs seriously! It’s 7 days of Fair Fish, checking out 4-H Projects, Hog Wrestling, Demo Derby, rides and games, and hearing local and some national celebrity musicians play at the outdoor auditorium! In our county, practically everybody attends so you spend most nights visiting with neighbors, friends, and relatives! The Fair Queen is usually someone I know (except now it’s someone I know’s granddaughter!) so you chat with her and her court. 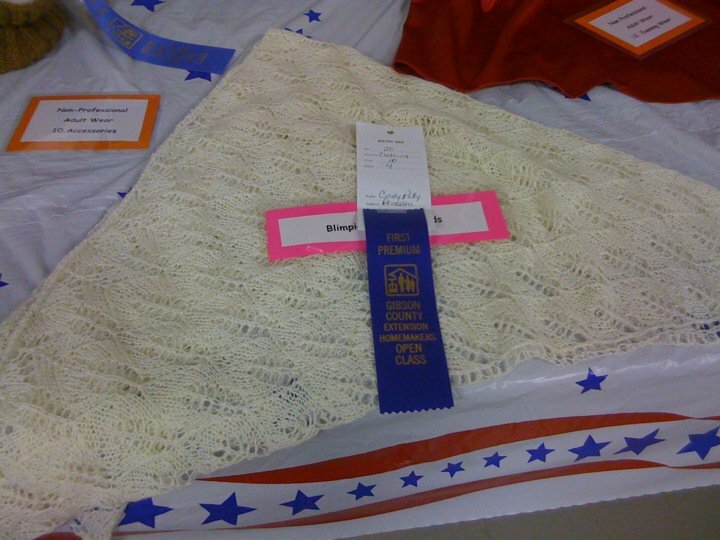 County Fairs usually have an Open Class competition in which you can enter your knitting, crochet, garden vegetables, cake decorating, photography, quilts, etc. I love the Fair so of course I enter! Our Fair i s held around the first of July so the month of June is when I check out my past year’s projects to determine which ones to enter. Most years, I get a blue ribbon but one year I won Grand Champion! Hooray! I’ve pictured here some Fair winning entries. Do you enter your County Fair Open Class Exhibits? Tell me how you did! and friends for years, I recently branched out to teaching a beginner’s knitting class at a local community college. But I have to admit, I was not as prepared as I should have been since I thought that no one would sign up. Was I wrong. I have 6 really special students and I am really enjoying teaching them the joys (and occasional frustrations) of knitting. Now that I have a couple of “professional” sessions…..although why I think getting paid to teach makes me more professional than when I taught for free, I’ll never know. Another thought for another day. Name tags help a lot. Have name tags for each class until you feel that you know your class well. Handouts are a must. I didn’t have any handouts prepared (although I was working on them) until the 2nd week. Here are the handouts I’ve used so far…*Welcome with information on local yarn shops, local Sit-N-Knit meetings, my phone, email, Ravelry name, etc. *Learning objectives and lesson plans (so your class knows what you will teach each time). *Easy pattern to try. I basically wrote my own slipper pattern with two different types of toes so the class could work whichever style they likes. Be prepared to have one or more who will need extra help. If you have a friend who can assist you, you can tag-teach and she can help some of the others while you do one-on-one teaching. Enjoy yourself! I did not realize how much fun it would be until I let myself relax and enjoy the camaraderie and fellowship. This is absolutely wonderful! You have to see it!!! Yes, dear friends, I am going to stop knitting my sweater for the Ravellenic Games Sweater Triathlon. My wrists are aching and I have a headache that will not quit. I will have to quit knitting on this project before I develop carpal tunnel syndrome. It’s okay, though. 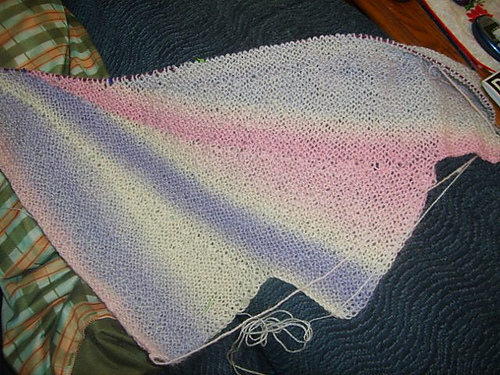 I learned a long time ago that I am a PROCESS knitter not necessarily a PRODUCT knitter. It does not bother me to tear out two weeks worth of knitting. I think that I have learned quite a bit during those two weeks. What have I learned? Well, that both patterns that I chose to help me overcome my lack-of-sweater-knitting skills were very good. Each of them gave me new skills that I will be able to use in my knitting. I also tried two different types of yarn. Unfortunately, I did not swatch yarn #2 very much to realize how tightly it would knit on size 6 needles (which was gauge for that sweater). And yarn #1 just did not feel right for the pattern I originally chose. Maybe I will make a sweater with yarn #1 and pattern #2; but just not this week. And that’s okay with me. I am going to finish watching those marvelous Olympians reaching their personal goals while finishing up a shawl and winding yarn for an upcoming Mystery Shawl knit-a-long. 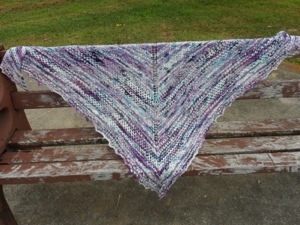 If you want to join me, check it out on Ravelry: Fantasia Mystery Shawl Group and find your yarn at Fiddle Knits Design. I am so very proud to announce that I have received my second Ravellenic Games Meda l. It’s for the Toy Toss! I had to knit something that was a toy. 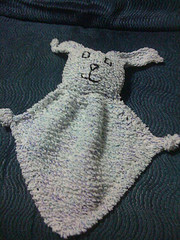 So I made a really cute and super fast Bunny Blanket Toy. I have been enjoying the Olympic Games and knitting so far, but my hardest project is yet to come….I know, I know I should have started it first (and I actually did, but I put the first one aside and changed yarn/pattern/needles/etc.) Even if I don’t get it knit in time to be awarded a medal, I am determined to knit myself a cardigan. How about you? Do you like to knit and watch sports on TV? I have a friend who loves to knit and watch NASCAR. I still don’t care to knit complicated projects while watching sports, (especially if I have to count stitches or rows) but so far these projects I’ve done have been pretty easy. I’m more of a Masterpiece Theater knitter. Well, back to the Games! Knit on! Have you ever purchased a yarn just because it looked so pretty? That’s how I ended up with my pink/white/blue Zauberball. But I had no clue as to what to do with it … until recently. I saw on Ravelry a Wingspan Shawl and shazam! There it was. It’s a very easy short-row pattern that is all garter stitch so you can knit while watching TV. I can’t wait to finish it.